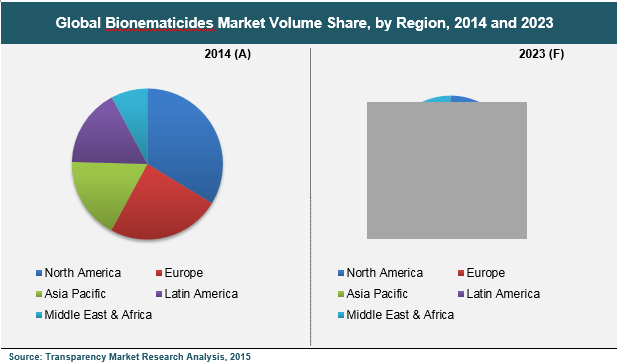 Transparency Market Research has published a new report titled “Bionematicides Market - Global Industry Analysis, Size, Share, Growth, Trends and Forecast, 2015 - 2023.” According to the report, the global bionematicides market was valued at US$ 140.5 Mn in 2014 and is likely to reach US$ 203.5 Mn in 2023, expanding at a CAGR of 4.2% between 2015 and 2023.Bionematicides are used to prevent or treat crop infestation by nematodes.Bionematicides generally comprises bacterial or fungal spores and inert material. Spores included in the bionematicide germinate and paralyze the organism after coming in contact with it. It is available in liquid and powder form. The advantages of bionematicides include no resistance development, no residues, and no resurgence.